Summer-Long Flowers, Fully Hardy - Perfect For Your Patio! One of the UK's favourite exotics, Oleander adds a real Mediterranean feel to your patio. Sweetly perfumed pink, red and white blooms standing out against their rich green, glossy foliage. Flowering from May to September, each Oleander plant looks stunning in a terracotta pot. Supplied as 3 fully established plants in 17cm pots, 1 each of red, white and pink. 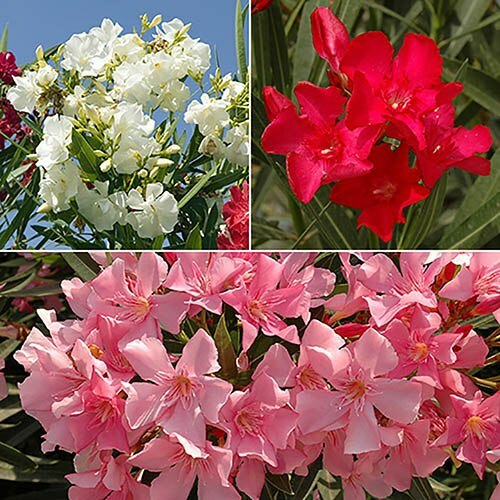 3 Sweetly Fragrant Mediterranean Oleander Plants Smothered In Summer-Long Flowers, Fully Hardy - Perfect For Your Patio! One of the UK's favourite exotics, these gorgeous Oleander plants will add a real warm Mediterranean feel to your patio or balcony with their boldly coloured, sweetly perfumed pink, red and white blooms standing out against their rich green, glossy foliage. Flowering from May to September, each Oleander plant looks stunning in a terracotta pot on a patio or balcony. So easy to grow, Oleander plants simply love hot dry weather, yet are perfectly happy in conditions down to -5°C. Brilliant value, these large, 3 year old plants are supplied fully established in 17cm pots. Supplied as 3 fully established plants in 17cm pots, 1 each of red, white and pink. Approx. 2 years old and 50cm tall. Will grow approx. 10cm per year in the UK. Important: Contact with oleander foliage and its sap may irritate the skin. All parts of the Oleander plant are toxic if ingested. Best in a large pot, in full sun, so can be moved to shelter in winter to keep looking at its best. Take care when handling - no need to trim to shape, as it will naturally branch over several years. Pot up using a soil-based compost such as John Innes No 3. Water freely in summer and apply a balanced liquid fertiliser every two weeks until June. Then switch to high potassium fertiliser, using it until the flower buds show colour. In winter, stop feeding, reduce the watering, (keep plants on the dry side). Flowering occurs in late summer (July to October) on new shoots of the current season’s growth, so prune in late winter or early spring. Remove all thin crowded shoots and tip-prune young plants. Cut flowered shoots by half and the side shoots to 10cm (4in).